Here I go again with weird prints. I think it's funny how every single one of my button down shirts is a print. Apparently I can't wear basic ones. I do have a purple one from an Equipment sample sale but I never wear it because of the fabric (not as breathable as my other Equipment blouse.) I wore this the day before we had a freak snowstorm. It was warm and springlike and then next thing we know it snows most of the day on Friday. I love a good printed blouse - you're lucky you have such a good collection of them! 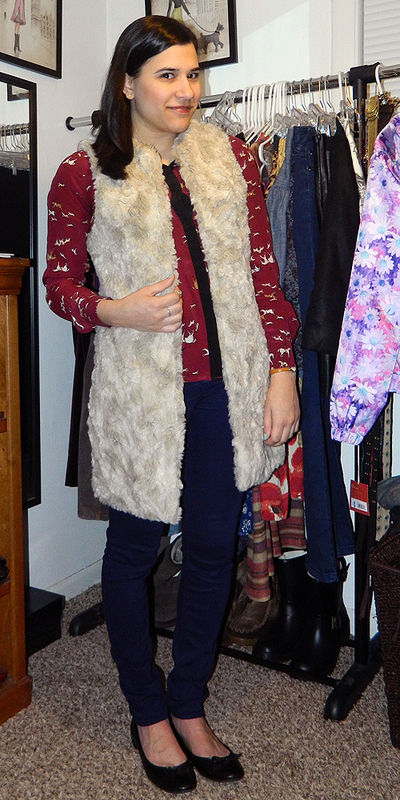 Yes, I want spring again, and I love that vest - so cozy and cuddly! SO very pretty, then and NOW - now that i think of it I am more of a plain shirt person.